Medium-chain triglycerides (MCTs) for weight management and increased energy for everyday. Anjou Coconut Oil is amazing! First of all I love that it's organic, unrefined and cold-pressed. Coconut oil has so many uses and many many benefits. 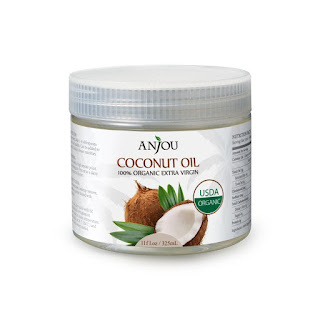 I love to use Anjou Coconut Oil as a hair mask to provide my hair with moisture like no other product can. My kids also suffer from bouts of eczema and the only thing that truly helps them is coconut oil. Anjou Coconut Oil softens my elbows, knees and works terrific as an after shave lotion for my legs. Anjou Coconut Oil is perfect for baking and cooking and is an extremely healthy alternative to many cooking oils on the market. I also found that by taking a tablespoon of this oil in the morning I was able to boost my energy which is by far my favorite use for coconut oil. Anjou Coconut Oil is amazing and I highly recommend it!